The first part-time Master of Science students to graduate from Wittenborg University of Applied Sciences celebrated their achievements on Friday during Wittenborg’s 2016 Summer Graduation Ceremony in Apeldoorn. They are Don Driessen, Amber Herrewijn and Marjorein van Houten-Geut. 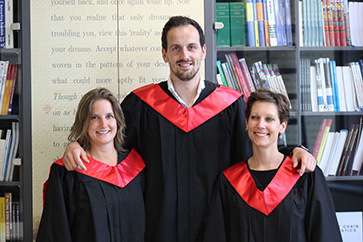 All 3 were awarded an MSc in International Event Management – earning a double degree from both Wittenborg and the University of Brighton in the UK. All 3 students are Dutch and lecturers at universities around the Netherlands. They completed their studies over a period of about 2 years while balancing work, family and studying. 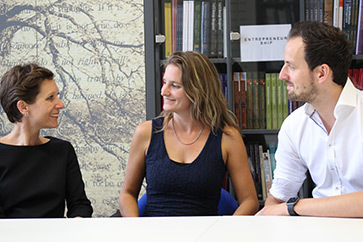 They were able to earn a double degree due to Wittenborg's partnership with the University of Brighton, adding further value to their prestigious achievements. This means that on top of the certificate they received on Friday from Wittenborg, they will also receive a degree from Brighton on 29 July in the United Kingdom. 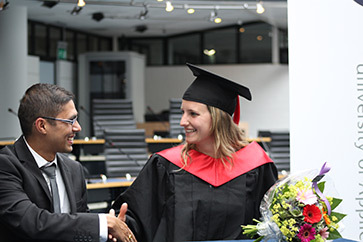 Wittenborg admitted its first cohort of international Master of Science students in September 2012, followed by another intake in September 2013. Since then its MSc programmes in International Hospitality Management, Event Mangement and Tourism Management have gone from strength to strength. 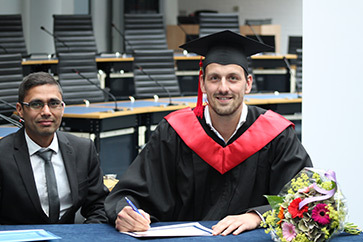 From this autumn it will also jointly offer an MSc in Sport Business Management with the University of Brighton. First to receive his diploma on Friday was Don Driessen who lectures in event and project management at Fontys University of Applied Sciences. He thanked his fellow students for motivating him during his studies. Wittenborg’s Director of Education, Peter Birdsall, praised him for his perseverance in the face of several obstacles, such as a forced delay in collecting data while under severe time pressures. Fellow graduate Amber Herrewijn received a mark of 80% for her research project and a superb recommendation from her supervisor, who advised her to publish her research. Birdsall also expressed hope that with the level of excellence she achieved that she would eventually follow her master's degree with a PhD. Herrewijn said: “This definitely enhanced my view of how my own students feel when they are struggling with their research. Now I have a better understanding and more empathy." Graduate and mother of two, Marjorein van Houten-Geut, said the toughest part of completing her degree was balancing it with work and time with her family. Birdsall said the fact that she overcame all these obstacles made her achievement even stronger. Houten-Geut researched aspects around the safety of spectators at motor events and whether local governments are able to comprehend and judge the risks associated with these events.